"We believe from our studies that the above George and Conrad both took part in the Revolutionary War. 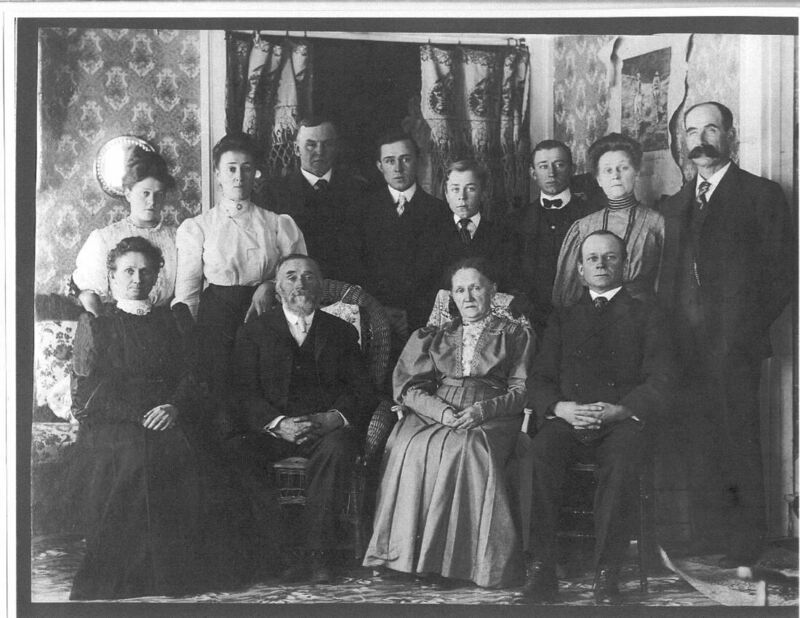 Conrad and his wife Engelga was the parents of a large family and at the time of his death was living near Schuyler Lake. He had several sons and may took part in the war. Three are prominently mentioned as living on the south side of the Mohawk River in the town of Canajoharie and vicinity after the war, namely Johnathan, Nicholas and George. Johnathan lived at Indian Castle during the war. Besides the three mentioned above there was one brother Harmanas who was a Tory. We have good reason to believe that Capt. Christian House was also a brother of those mentioned above." The line of descendants from Johann Christian Hauß that is most closely followed in The House Family of the Mohawk¹ runs through a son named Jurrian (George) in the second generation. It's a proud line of hardworking people who fought for everything they could get in life. But the quote from the book, above, is most likely incorrect, as George would probably have been in his seventies or eighties during the Revolutionary War. It is entirely feasible that his son Conrad, would have been about fifty, and did fight alongside his sons (well, three of them, anyway, as at least one fought with the Loyalists). I. Conrad Haus was born 7 Jul 1729 in Schoharie, Montgomery, New York. He married Engelge (Angeline) (1740-1790), and they had the following children: Harmanus House (1734-1816); Christian House (1755-1804); George House (1757-1833); Johnathan Joseph House (1760-1824); and Nicholas House (1760-1829), all to be detailed later in this chapter. Conrad fought with rebel forces during the Revolution and was killed at the battle of Oriskany, on 6 Aug 1777 in Oriskany, Oneida, New York. II. Maria Elisabeth Haus was baptized Oct. 30, 1734 at the Dutch Reformed Church of Schoharie. Sponsors; Maria Elizabeth and Herman (Harmonius) Haus. No further information. III. Maria Dorothia Haus was baptized Jan. 7, 1736 at the Dutch Reformed Church of Schoharie. 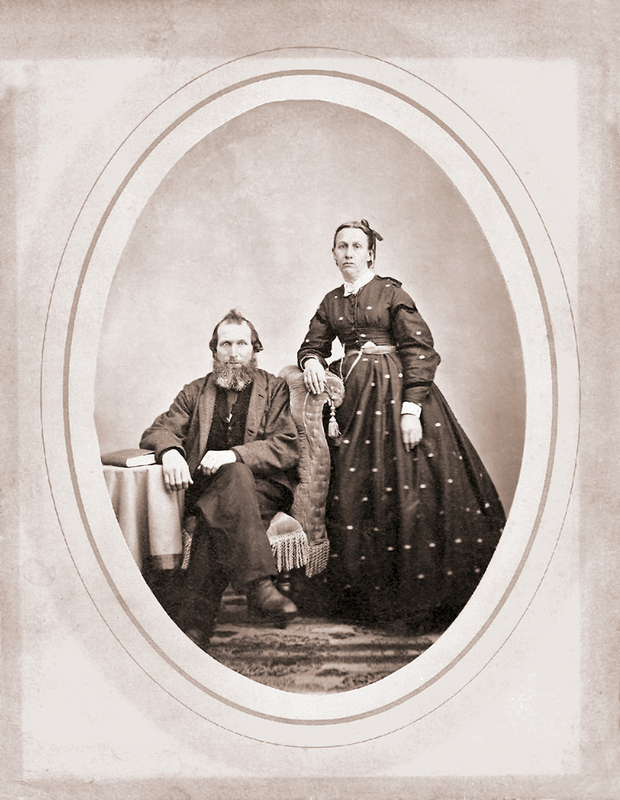 Sponsors, Hendrick Kneeskern and Maria Dorothea Warner. No further information. 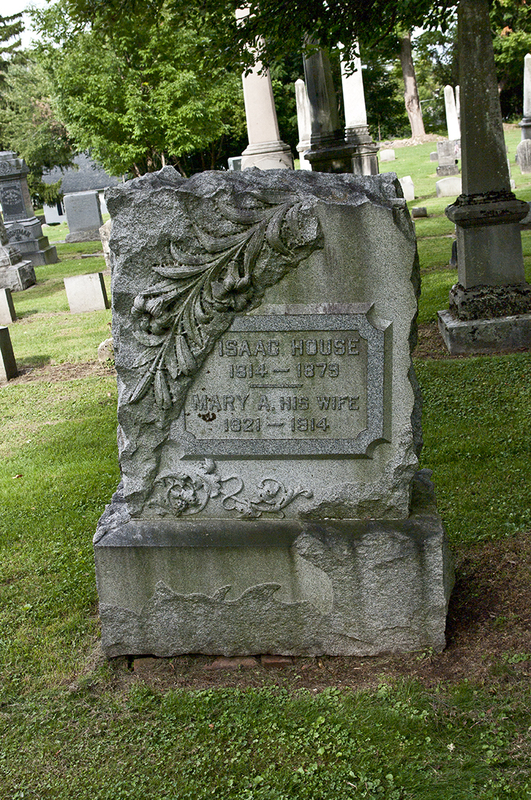 Grave of Maria Elizabeth House-Stalee at the McDougal Cemetery, Johnstown, Fulton, NY. 1. Maria Elizabeth House was born on 23 Jun 1756 Herkimer, Herkimer, New York. In 1773, she married Johann Jacob Staley (1754-1811) in Fulton, New York, but their story is very detailed. From HFOTM: "I will quote from a letter received from F.S. Hammond (now deceased) of St. Petersburg, Fla.'My wife is the great grandaughter of Mary Elizabeth House, born in 1753. Her parents were killed in the French and Indian raids on the Palatine Village in November, 1757, when she was four years old. She was taken to Canada. Twelve years later Jacob Staley, then a young man, went to Canada with a pack of cheap jewelry and trinkets to trade with the Indians. He found her there and bought her from the squaw who had her and brought her back to the Palatine fort. Two years later he married her. They had ten children, eight sons and two daughters. 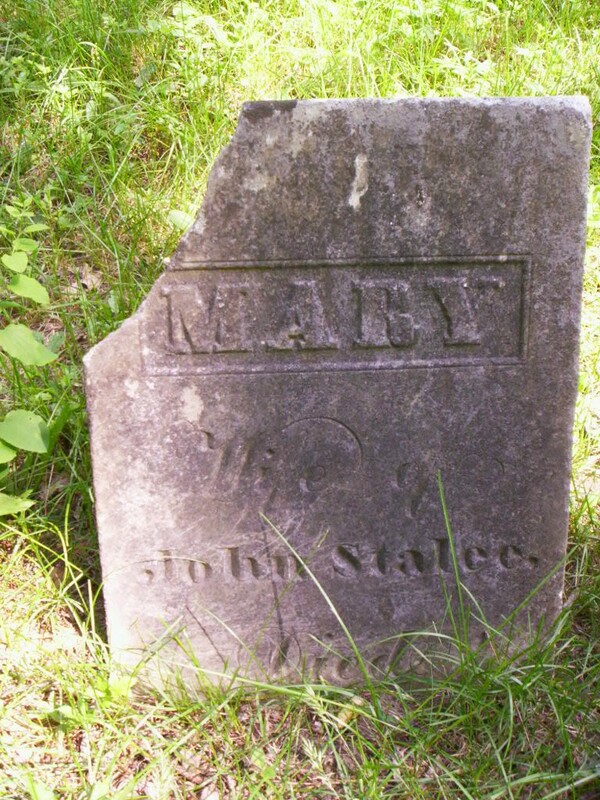 Jacob Staley died at or near Johnstown, N.Y. in the year 1811 and Mary Elizabeth died at the home of her youngest daughter, Catherine Staley Gage of Johnstown in 1825. The eldest daughter, Lucinda, born in August, 1774, married William Brown, born in Connecticut in 1773. I have very complete records of both the daughters and of one son Henry and some accounts of other sons. These records furnished me as above by Jacob H Brown, 1827-1915, by a daughter of Catherine Gage and by a grandson of Henry Staley, all descendants of George House and Mary Elizabeth Staley.'" a. Merle Brooks (b. 1914). b. Fern Brooks (b. 1916). c. Donald Brooks (b. 1918). d. Leonard Brooks (b. 1920). f. Lois Brooks (b. 1924). g. Dale Brooks (b. 1925. 2. James Aaron Bridge (1892-1975) married Phyllis Josephine Mahnke (1895-1976) and they had the following children:). a. Louise Bridge (b. 1914). b. Ruby Bridge (b. 1918). d. James Bridge (b. 1922). e. Marjorie Bridge (b. 1924). f. Wayne Bridge (b. 1928). g. Ray Bridge (b. 1930). a. Carrol Elsworth Bridge was born on 8 May 1919 in Wagner, Charles Mix, South Dakota. He died on 5 May 2008 in Athens, Henderson, Texas. a. Donald Bridge (b. 1923 in Iowa). a. Ruby Ellen Card (1922-1989). b. Wayne Franklin Card (1923-1999). 2. George W Card was born on 13 Jan 1901 in Washta, Cherokee, Iowa. He married Laura E (b. 1902). a. Darlene Florence Card was born on 28 Aug 1929 in Iowa and died on 3 Dec 2006 in Sioux City, Woodbury, Iowa, and married William Peterson (1923-2000). 4. Clifford Card was born in 1909 in Iowa City, Wright, Iowa. 1. Agatha B Card (b. 1904). 2. Miles A Card (b. 1905). ii. James Andy Card was born in Mar 1880 in Parkersberg, Butler, Iowa. iii. Hannah A Card (b. Jan 1884). 1. Edna Card (b. 1909). 2. Fannie Card was born on 23 Apr 1914, and died on 19 Nov 1997 in Bellevue, Sarpy, Nebraska. She married John Paul Noordam (1911-1993). 3. John Card (b. 1922 in South Dakota). vi. Francis A Card (b. 1897). vii. Marie Alice Card (b. 1899 in Iowa). i. Ella C Perry was born in 1871 in Butler, Iowa. She lived in Pettsford, Butler, Iowa in the 1895 Iowa state census. a. Florence Barquest (d. 2006). b. Vera Elaine Lucille Barquest (1929-2003). c. Dorothy Jean Barquest (1931-2007). a. Roberta J Christoffersen (b. 1927 in Iowa). 3. Marcus Perry (b. 1905) married Helen L. (b. 1908) in Iowa. iii. Edward A Perry was born in Jul 1892 in Iowa. 1. Maggie Smith (1891-1967) married Thomas R Baggott (1884-1974). a. Cecil Henry Mather (1917-1930). i. Martha Jane Patterson (1938-2008). a. Charles Leroy Pike (1919-1958). b. William Henry Yaw (1921-2011). c. Edward Myroland Yaw (1922-1922). d. Leonard Howard Yaw (b. 1924). e. Marybelle Yaw (b. 1927). f. Dollie Geraldine Yaw (1929-1929). g. Harry Cleotis Yaw (1931-2007). h. Vivian Ladeava Yaw (1933-2002). 4. Charles W Smith (b. 1903). 5. Nellie June Smith (1905-1985). ii. Casabianca Cinnamon (b. 1876). iii. Martha R Cinnamon (b. 1879). g. Charles Elmer Card (1865-1956). 2. Elizabeth Malita Card (1822-1870). 6. Thomas Card (b. 1847). 7. Lucy Card (b. 1849). iii. Elizabeth Brown (b. 1810). iv.  Mary Brown (b. 1810). vii. Joseph Brown (b. 1813). viii. Peter Brown (b. 1817). ix. Ira Lansing Brown (1824-1875). x. Jacob H Brown (1827-1915). d. Johannes George Staley (1784-1871). f. Balthasar Baluis Staley (1786-1884). h. Heinrich (Henry) Staley (1793-1874). Maria Elizabeth died on 4 Jan 1843 in Johnstown, Fulton, New York, and is buried there, at McDougal Cemetery. 2. George House III was born on 19 Apr 1775 in New York. On 26 Oct 1794, he married Catharine Kilts in Palatine, Montgomery, New York. a. John House was born on 6 Jan 1795 and baptized at the Dutch Reformed Church of Stone Arabia ("Son of George Hauss and Catherine Kills. Sp. Philip Kills and Wife Elizabeth). He married Catharine Davis (b. 1795). b. Conrad House was born on 22 May 1796 in Palatine, Montgomery, New York. c. Maria House was born in 1799 in Palatine, Montgomery, New York. d. George House IV was born on 30 Sep 1802 in Palatine, Montgomery, New York. He married Elizabeth Shapley (1807-1892) and had the following children: Catharine J House (b. 1837) and Charles Heber Hauss (b. 1847). He died in Aug 1880 in Virgil, Cortland, New York. e. Philip House was born in 1805, in Mohawk, Montgomery, New York. f. Gerret House was born on 9 Aug 1810 in Johnstown, Montgomery, New York. He married Sarah, and had two daughters, Sarah and Gertrude. He died on 22 Jun 1900 in Buffalo, Erie, New York. 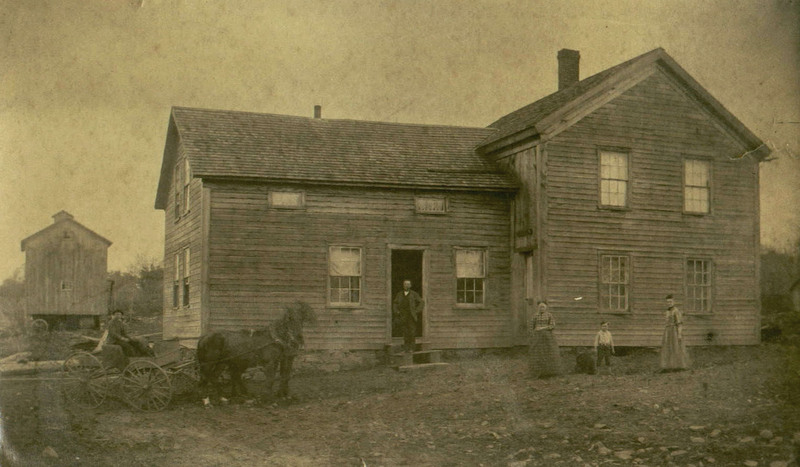 g. Heinrich House was born on 2 Feb 1813 in Palatine, Montgomery, New York. It has been suggested that George II was a Loyalist during the Revolution (although there were a lot of Georges at that time) who served with Butler's Rangers throughout the war. On July 15, 1783, the holdings of George House of the Canajoharie District of Tryon County were confiscated and auctioned at a Sheriff's Sale. A claim by George to the British government, dated August 30, said he joined up in 1777, and served all the War under Col. Butler in the Rangers; Had some Lands on the Mohawk, had no Lease but had lived on them 15 years before the War, and had built a house. He only Claims for the Buildings 24£, he had 4 horses & 2 Colts, Utensils, furniture, grain in the ground, all of which he left behind. He was the awarded land in Lincoln Co., Ontario, Canada, by the British government. Christian (1) and first wife, name unknown. George (2) and Maria Catherine Ecker. We have been able to determine without any chance of contradiction the fact that Conrad and Engalge, his wife were the parents of Jonathan, Nicholas, George and Harmonus House. Conrad and Engela's children will take up the remainder of this chapter. 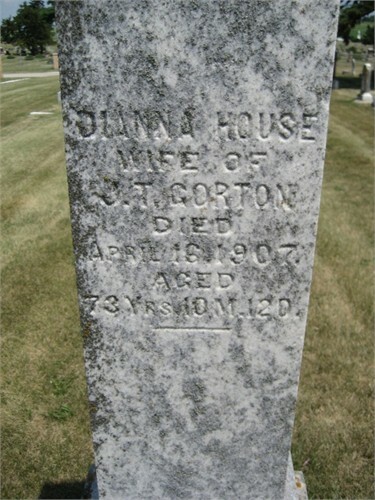 Their son John House was born about the year 1760. The exact date is unknown as we have been unable to find as yet the baptismal records of the children of Conrad House and his wife Engelge. But we do know that in the year 1822 John House visited his son Abraham at Parish, Oswego County and at that time gave his age as sixty two years. As to the brothers and sisters of John we can quote the following as positive. Nicholas married Catherine Spohn. ( Later in the manuscript the spelling changes to SPOON and back ~ Jim House) George married Maria Mabie. Harmonas a Tory who is referred on page 177, Vol. 2, "Frontiersmen of New York" by J. R. Simms. Lea who married James Woodward. Captain Christian House was undoubtedly a brother as he lived near the other sons of Conrad and Engelge are mentioned as sponsors at the birth of some of Captain Christian House's children, one of whom was named Conrad. There were without a doubt others whom we have been unable to place at present. Conrad House and wife together with James Woodward are mentioned in the census of 1790, page 106 as living at Schuyler Lake in the town of German Flats. These two families were either living together or on adjoining property. James Woodward and Catherine House had a daughter Angeligne Baptized in 1790 with Conrad House and wife Angeligne as sponsors, John Kelly and wife Lea House had a daughter Angel Baptized in 1792 with Conrad House and wife Angel as sponsors. In the above three records the name of wife of Conrad House is spelled in three different ways and shows what a genealogist is up against in trying to identify the different branches of families. John Kelly and wife Lea had a daughter Maria baptized July 2, 1793. George House and wife Maria sponsors. The census of 1790 gives Jonathan, Nicholas and George as living at Indian Castle which was on the south side of the Mohawk River Between Little Falls and St. Johnsville. Who Harmanas married we do not know for sure but believe his wife to have been Margreth. History and family tradition say he was a Tory and John House often mentioned him with regret. The census of 1790 mentions as neighbors of the House's at or near Indian Castle the Mabies Walraths, Herkimers, etc. That the Houses and Herkimers were great friends is shown by records of that time. In a letter from the Hon. F. W. Crisrmas he says that George House was a witness to the will of General Nickolas Herkimer. We will now leave the early history of the House family and take up the war record of Jonathan, one of the brothers mentioned in a former article. In a list of Capt. Jost Dygert's company in Col. Clyde's regiment under payroll certificate No. 11199 as published in the Enterprise and News of May 1st, 1929 we find the name of John House, private. Also, see "New York State Revolutionary War Manuscripts." John House was a private in the company of Capt. Jost Dygert who was in command of General Nicholas Herkimer's front guard in the battle of Oriskany Aug. 6, 1777 as per Jost Dygert's pension papers. John House listed as private in a company of Tryon County Rangers. Also public papers of George Clinton Vol. 5, page 188. Also private in a company of Tryon County Militia by Col. Campbell & Col. Fox. General Sullivan's Expedition, Camp Jacunas Farm, twenty miles by land from Lake Otsego Aug. 10, 1779. I enclose and account given me by a certain John House who was brought into camp by one of my scouts the day before I left the lake. This information I am inclined to credit as the particulars are chiefly confirmed by Col. Klock in a letter dated the 7th inst. "By James Clinton to George Clinton." 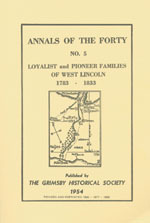 Volume 5, page 189-190. John House in account given by himself saith, That on the 2nd instant he was taken prisoner by Joseph Brandt and a party of twelve Indians and Tories who conveyed him some miles into the woods when Brandt and four Indians went off lofting him in charge of the others, and after an absence of about four days they returned bringing Brandt on horse back, wounded in the ball of the great toe by a swan shot; That a bullet and several swan shot had passed through this coat and breech clout; That he understood from one of the Tories they had made an attack upon some of the inhabitants of the Mohawk River near the Little Falls where the said House lived; That they had taken one prisoner whom being closely pressed they killed and narrowly escaped with the loss of their blankets and plunder, that even after they discovered a party of our people which put them to flight; but House being lame by being teed at night and marching without shoes, which with the greater part of his clothing they took from him they determined to kill him, but being acquaintance of Butler's he was permitted to return after taking the oath of neutrality, a certificate of which Brandt gave him written in the Indian Language, signed by himself; that they also informed said House that they lately came from Minesiuk where they had an action with our people and in which they took about thirty four prisoners, among whom were some officers and killed several; that they then proceeded to the river, where they carried on the second inst. The day they took House, which was about twelve days from the action at Minesiuk. It is also stated that information which House gave Brandt regarding the strength and manuvors of our people prevented an attack by Brandt and the Tories upon Clinton's party. Page 269: "The Old New York Frontier" by Frances Whitney Halsey. "Brandt's letter adds that on reaching Oghwaga he learned that Gen'l Sullivan perhaps by this time may be at Shimong where I have sent my party to remain until I join them." He himself was just setting out with eight men for the Mohawk River In order to discover the enemy's motions. General Clinton was still at the foot of Otsego lake with ten days longer to remain. Brandt proceeded up the Unadilla River to the Mohawk where he captured a man named John House. House became lame from marching and the Indians prepared to kill him, but Brandt ordered that he be released on a promise of neutrality. One of General Clinton's scouts afterwards found House and the day before his departure from the lake, brought him into camp. House had particulars of the threatened invasion from Canada by the way of Buck Island. Fort Schuyler was to be attacked. From John House('s) further activities in the Revolution it would not seem that he took his oath of neutrality seriously." I will not dwell here longer on John House's revolutionary record, but will pass on to a later period in history and take up his further military activities. Page 795, year 1805John House appointed Ensign, Vice John J. Fealling appointed Captain, Vice Coonrad Helager moved. Montgomery County 1805, Lt. Col. Andrew Gray's Regiment. In the same publication page 1182, Vol. 8 year 1811. Ensign John House appointed Lieutenant Vice, John J. Klock resigned. Page 1327, Vol. 2, year 1812, Lieutenant Jacob Snell's Regiment, Brigade commander by Brig. Gen. Richard Dodge. Page 1480, Vol._____year 1814. Captain John House resigned and Thomas Wilbur appointed, Nineteenth Regiment, Andrew Zabriske, Lt. Col., Vice Jacob Snell appointed Sheriff. Captain John House as we must now call him as he has always been called down through the history and tradition of the family had a long and honorable military career, during the American Revolution. The war of 1812 and as a training officer of the militia. Tradition says that he was about seven feet in height and that when any trouble arose among his men in training he merely laid his hand upon their heads and said boys be quiet and the trouble stopped. The genealogical history of John House will be taken up in a later writing. Many stories are extant regarding the life and doings of Capt. John House. These traditions have come down through the generations for over one hundred years and many have been lost by the wayside, but others have been handed down from mouth to ear and from generation to generation until the present day. Among these is the following as given to me by one of his great grandsons Howard H. House of of Richfield Springs. "In the early days of the settlement of twelve thousand or McCormack's Patent (afterwards called Coopers Patent) and lies between lakes Canaderaga and Otsego. John House was one of the first to settle in the northern part of the present town of of Otsego. He at one time saved the life of an Indian (name unknown) who afterwards was a firm friend of John's. They hunted and trapped together and the Indian lived with John till his death. At one time they were carrying a deer home through the woodland now on Charles Rose's farm when it became dark and they found themselves surrounded by wolves so they placed their backs to a large tree and stayed there until morning, then carried home the deer as the wolves left at daylight. Again he says this Indian knew of some places where he could get lead for their bullets. He would take John to a certain tree and then he would go out of sight and after a time would return with his buckskin short (shirt?) filled with chunks of lead which he had cut off with his knife, then dividing the load they would carry it home. There seemed to be an understanding of honor between them that the location of the lead should remain a secret. And again he tells that at one time they discovered a bee tree which they robbed, the Indian refusing to leave until they obtained all of the honey although stung so badly they could not see and John had to lead him home. Capt. John House was a very religious man and one night when his family returned home from attending a gathering at a neighbor's they found him kneeling at his bedside in an attitude of prayer, but his spirit had flown. Thus he died in the year 1824. I. The first child born to John Howe (House) and Lena Van Slyke was named John and undoubtedly died in infancy as we find no record of him except of his baptism: "Parents John House and Lena his wife. Child John born August 1, 1779 baptized Sept. 1, 1779. Sponsors John Vasn Slick and wife Margaret" (Rev. Abraham Rosencrantz, German Flats Church record Vol. 1 page 36). IV. Of Dorothea (b. 22 Jun 1781), we have little or no record. V. We have good reason to believe that Peter (b. 1792 in Canajoharie, Montgomery, New York) at one time lived in the town of Columbia. i. Anna Belle Fravor (b. 1872). ii. Myra Adelia Fravor (1880-1966). iii. Charles Henry Fravor (b. 1884). iv. Mary W Fravor (1888-1960). v. Cecil F Fravor (b. 1898). i. Ethel House (b. 1883) married George Young (1876-1935). ii. Frank Vincent House (b. 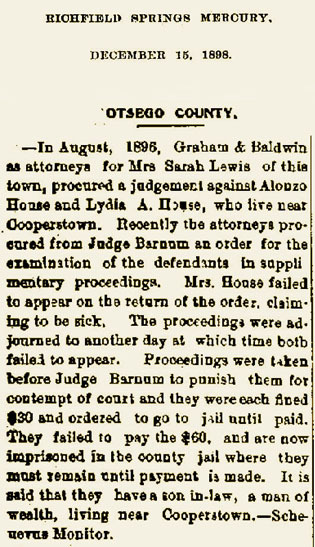 16 Aug 1895 in Syracuse, New York. On 27 Sep 1917, he enlisted in the army at Pulaski, New York, and fought in World War I.
c. Nicholas M House 1857 in Amboy, Oswego, New York; He died in 1901; He married Cora Livinia Johnson 1885 <ETH> 1965), and they had:. i. Edward Peter House was born on 21 Jun 1901, and married Josephine J (b. 1898 in Germany). They had a son, Edward P House, born 1924 in Syracuse, New York. d. Martha M House was born in 1858 in Amboy, Oswego, New York. No further information. i. Jennie Almeda Dayger (1882-1957). ii. Maud Wellena Dayger (1884-1973). iii. 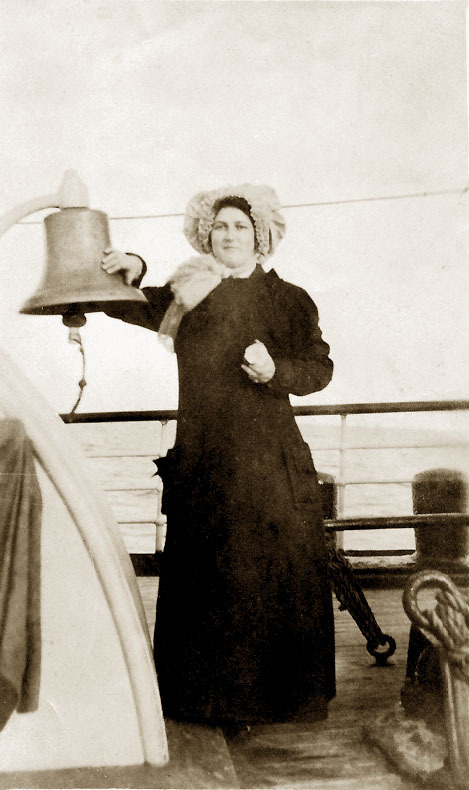 Mary Margaret Dayger (1886-1909). iv. Ursula Edna Dayger (1890-1918). v. Enola Hazel Dayger (1892-1986). vi. Nellie Jesse May Dayger (1894-1974). vii. Nicholas Franklin Dayger (1896-1960). viii. George Willis Dayger (1902-1986). i. Grace House (b. 1903). She does not appear on the 1910 census. i. Ivy M House (1889-1975). iii. Ruth A House (1893-1976). iv. Lucy A House (b. 1894). v. John W House (b. 1896). vi. Florence House (b. 1896). vii. Mary H House (b. 1898). viii. Harold C House (b. 1900). ix. Frank House (b. 1901). xi. Lois House (b. 1904). xii. Dorothy House (b. 1905). xiii. Catherine House (b. 1908). xiv. William House (b. 1909). h. Fowler H House was born in 1869 in Amboy, Oswego, New York. In 1894, he married Mary A. (b. 1873), but he then died in 1900.
i. Denzel House was born in 1873, but died as an infant. i. Blanche Adelia Mae House was born on 13 Aug 1901 in Oswego, Oswego, New York. On 23 Oct 1926 she married Benjamin Peter Crowell (1898-1975) and raised: Barton H Crowell (b. 1924) and Blanche Elenore (1927-1977). k. Medora Marthy House was born in 1876 in Amboy, Oswego, New York. She married Frank Smith (b. 1876) and they lived in Rochester Ward 12, Monroe, New York , in 1920. 1. Lana married Amasa Robertson, lived in Chicago at the time of the fire in 1871 and as she was never heard from afterwards it is supposed that she perished in the fire. 2. 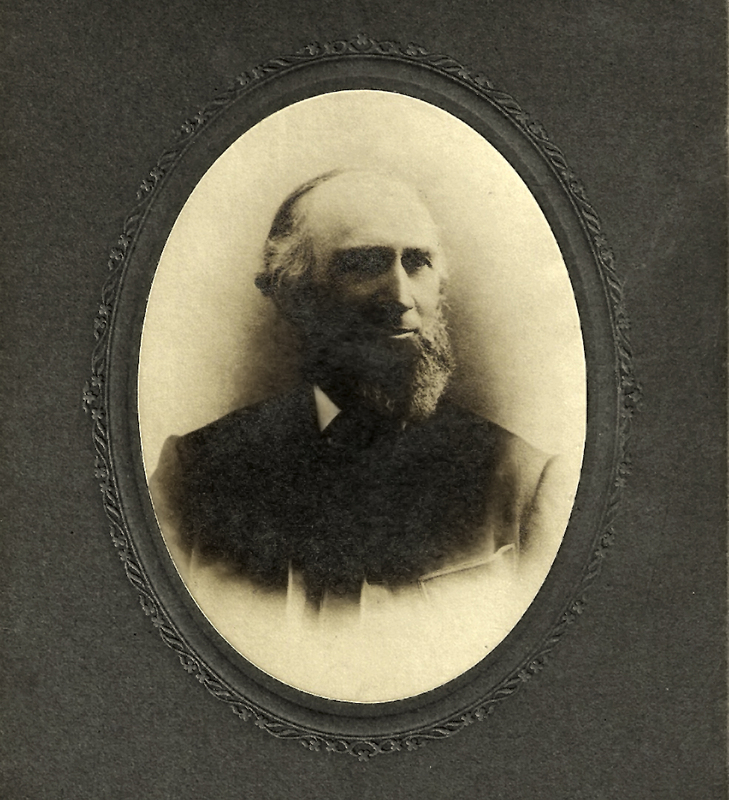 James was married twice and after his second marriage moved to Iowa and later to Nebraska where he died. 3. Nancy was born on 21 Nov 1807 in Herkimer, Montgomery, New York; She died on 10 Apr 1888 in Oswego, Oswego, New York. On 27 Oct 1839, she married Caleb A Sherman (1804-1878). Lived on Parish, N. Y.
a. Stella Mae Sherman (1840-1840). b. Mary Sherman (b. 1841). c. Sarah Elizabeth Sherman (b. 1842). d. Sarah S Sherman (b. 1842). e. Charles Henry Sherman (b. 1844). f. Henry Charles Sherman (1849-1872). a. James (b. 1870) who died as a young man (he was still alive for the 1880 census. ~ JH, 2012). a. Ada N was born in Aug 1854 in Oswego, Oswego, New York. In 1877, she married Duane M Hubbard (b. 1852), and they had the following children: Leroy Hubbard (b. 1880), Warner Hubbard (b. 1882), Howard D Hubbard (b. 1884), Lula Hubbard (b. 1887), John Alexander Hubbard (b. 1889). a. Emily J House was born in 1843 in Oswego, Oswego, New York. She married Gideon Pitcher (b. 1841) and they lived in Mexico, Oswego, New York. b. Mary M. (1849-1921) married Joseph H Mallet (b. 1845 in Canada), and they lived in Oswego County, where he worked as a machinist. c. James Wellington was born in Jun 1851. In 1878, he married Nancy M. (b. 1856) and they had a son, Clayton House (b. Sep 1879). In the 1880 Federal Census, the family is living with Catherine in Parish, Oswego, New York. James and Nancy are still living there in 1920.
d. Dollie A. (no information). e. Ella A. (1853-1854) died as an infant. f. Edwin C. was born in 1856 in Parish, Oswego, New York. He married Ada (b. 1861) and in 1920 they lived in Hannibal, Oswego, New York. g. Eliza A. was living in Syracuse in 1880. No further information. i. Allen House: This is pure speculation, but an Allen House was born on 30 Sep 1829 in New York, lived in Parish in 1850 (US Census), and died on 27 Aug 1875 in Kewanee, Henry, Illinois. He married Eleanor Clarissa Enslow (1828-1915) and they had the following children: Orlando C House (1852-1931), Byron J House (1858-1929), Ada House (1861-1861) and Mary House (1867-1867). 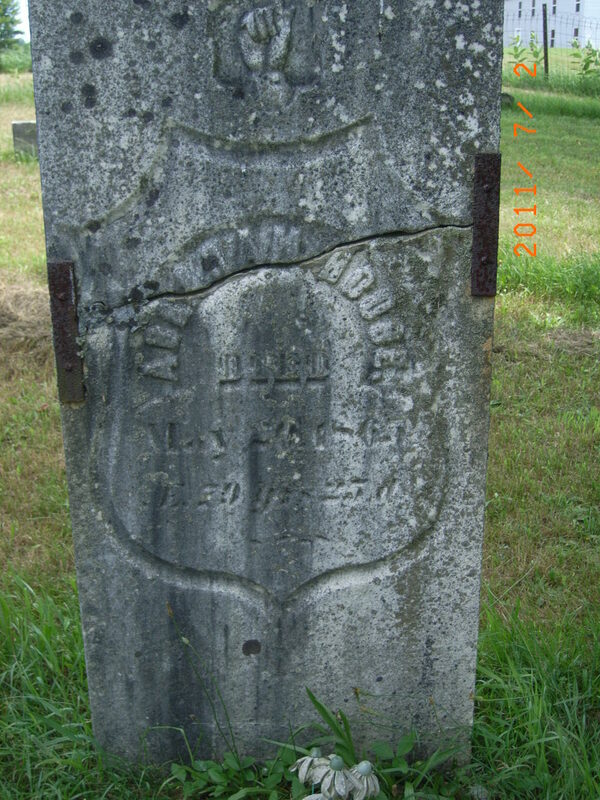 Abraham, another son of John House and Lena Van Slyke, married Nancy Hannah Mabie a daughter of David Mabie and Nancy Freymeyer who is said to have lived near Stone Arabia. A David Mabie was in Captain Jost Dygert's company in Col. Clyde's regiment. Was it the same man? We are very anxious to obtain further information regarding this Mabie line. Abraham and Nancy moved from the Mohawk Valley to Parish, Oswego County, New York, about the year 1817 bringing three children with them. 1. Andrew was born on 16 Mar 1810 and died on 6 Jan 1884 in Parish, Oswego County, New York . He married Elizabeth Scriber (1808-1895). Elizabeth Scriber's mother was a Mary Walrod or Walrath. Her father was Philip Scriber. We think from information we have that Mary Walrod was a daughter of Henry Walradt whose affidavit was published in the Enterprise and News of May 1, 1929.
i. Xixtus House (b. 1862). 1. Alta Ruth House (1888-1892). 2. Vern Alonzo House (1894-1895). 3. Owen W House (1896-1966). 4. Gladys Maria House (1901-1986). 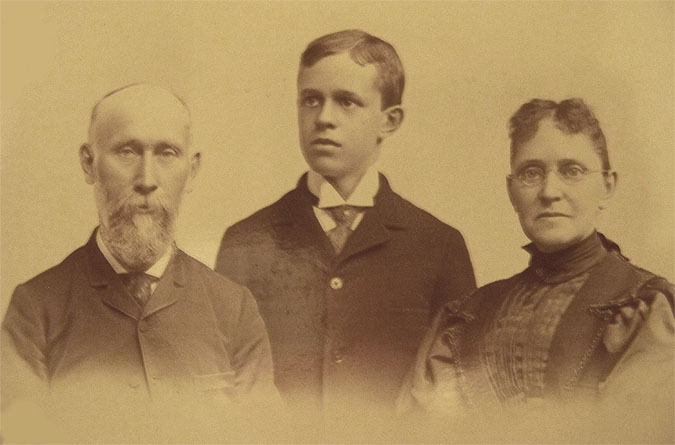 The family of Abram T. House, son of Andrew and Elizabeth Scriber-House, above. 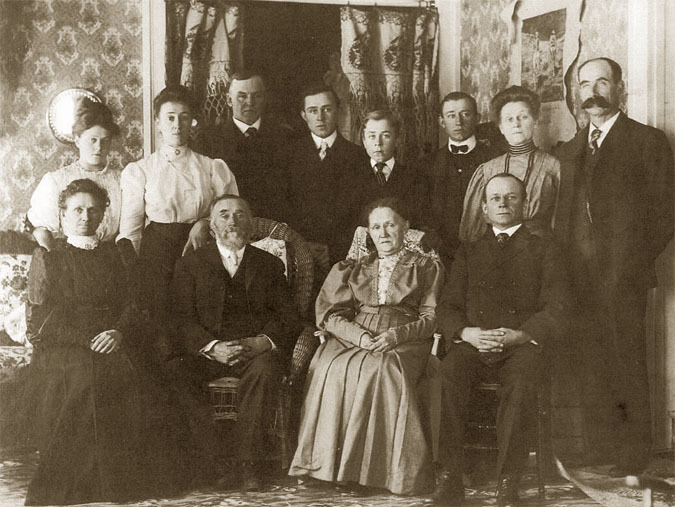 Front Row- Left to Right - Josephine House Carr (daughter), Abram T. House (father), Louisa White House (mother), Menzo House (son) Back Row - L to R - __?__ Richards (grand daughter), Cora House Richards (daughter), ___?___ Richards (son in law), Lewis House (son), ___?___ Woods (grandson), William House (son), Mamie House Woods (daughter), William Woods (son in law). ii. Cora E. House (1861-1880). iii. Menzo Lincoln House (1863-1951). iv. Mary A "Mamie" House (b. 1873). v. William A House (1875-1956). vi. Andrew House (Bet. 1876-1877). 1. Richard Loomis House was born on 13 April 1910 in Parish, Oswego, New York. He died on 03 Jan 1987 in Jordan, Onondaga, New York. 2. Mary Louise House was born on 3 May 1917 in Parish, Oswego, New York. She died on 15 Jan 2000 in Oswego, Oswego, New York. c. Albert B House (b. 1836). d. Amos J House (b. 1837). i. E Lyman Smith (b. 1862). iii. Arthur G Smith (b. 1866). iv. Joanna Smith (b. 1867). A book tracing the descendants of Johann Christian Hauß. 1. Rhodes Shaver was born on 21 Nov 1892. 2. Irving Albert Shaver was born on 18 Nov 1895 in New York, and married a woman named Beatrice. He died in 1973 in Arizona. 3. Elton Frank Smith Shaver was born on 25 Jul 1907. He married Marjorie Chapel (b. 1907). They had two daughters, Carol Sue Shaver and Patricia Anne Shaver. Elton died on 27 Apr 1992 in Hillsborough, Florida. Josephine died on Tuesday, 3 Aug 1956, at the age of 84. Melvin died on the morning of her funeral (Read the obituary from the Mexico Independent newspaper of Thursday, 16 Aug 1956). 1. Glenn Harter (b. 1887). 2. Beryl Harter (b. 1896). 3. William Wells Harter (b. 1898). ii. Ida House (b. 1869). 1. Gilbert Exton House (1912-1912). 2. Elizabeth Viola House (1913-1997). 3. Lloyd R House (b. 1917). 4. Glenn R House (b. 1920). Alva House (1842-1918), his son Lloyd Gilbert House (1881-1955), and wife Viola C. Gilbert-House (1846-1919); photo taken in Auburn, NY. g. Mary L House (1845-1846). h. Andrew G House (1849-1913). i. Addison S. House (1851-1933) of 236 Jamesville Avenue, Syracuse, N. Y. was born November 15, 1851 and died April 10, 1933. In his early years he was an educator and also possessed a high musical talent. On the evening of his death he was giving a Dudcimes concert accompanied by his wife, before the Parent-Teacher association of the Roosevelt junior high school of Syracuse. At the conclusion of his part in the entertainment he took his seat in the auditorium and in a few minutes was taken with a severe heart attack and passed away about fifteen minute after finishing his last concert. He was the son of Andrew House and Elizabeth Scriber of Parish, N. Y. who came there from Otsego county with Andrew's father Abraham about the year 1817. Abraham was the son of Jonathan. Addison S. House leaves to mourn his loss besides his wife Cora one son Earl of Syracuse and Mrs. John Hoffenden and Mrs. Irving Hoffenden of Syracuse and Mrs. Blanche Skallingas of Chittenango. Mr House was a member of the Rockefeller Methodist church of Syracuse from which the service will be held. Burial at Williamstown, N.Y.
i. Earl Clinton House was born on 20 Jul 1883. He married (1) Millicent Springer (1886-1926) and they had the following children: Marian House (b. 1904), Luella House (1906-1967), Norma House (1907-1924), Gertrude House (b. 1909). When Millicent died in 1926, he married (2) Maude (b. 1886 in Canada). ii. Elizabeth "Lizzie" J House (b. 13 Sep 1880) married John R Haffenden 1883) and they had the following children: Edith A Haffenden (b. 1910), Elmer J Haffenden (b. 1913), John Allen Haffenden (b. 1915). iii. Addie M House was born on 6 Oct 1885 in New York, and died in Jan 1963. She married Irving Duncan Haffenden (b. 1883) and had the following children: Edwin H Haffenden (b. 1908), Doris Haffenden (b. 1912), Cora L Haffenden (b. 1917). iv. Blanch(e) E House was born on 19 Dec 1888. She married Duane Skellinger (b. 1889) and they lived in Chittenango, Madison, New York, in the 1930 Federal Census. 2. Philona Hannah was born on 14 Nov 1814 in New York, and died in infancy. 3. Joseph was born on 17 Sep 1813 in New York. Wife's name unknown. He died in 1893 in Mexico, Oswego, New York. 4. David was born on 17 May 1815 in Oswego, Oswego, New York, and married Sophia Pierce (b. 1822). In 1880 they lived in Albion, Oswego, New York. 5. Simon was born on 17 May 1817 in New York. He married Pamelia Rowe (b. Oct 1822). He died in 1890. 6. Caroline married first Amos Martin, second George Sherman. 7. 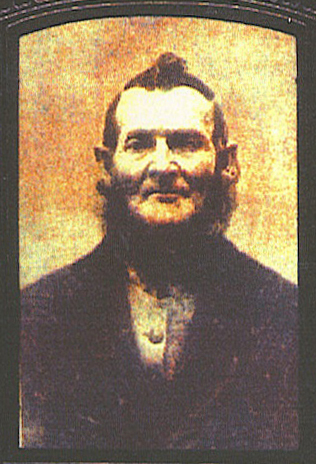 Abraham married first wife unknown, second wife Mary Orr. 9. Leonard married Catherine Westover. 10. Norman went to Chile, So. America and there married and died. 11. Conrad married Sarah Robinson. 12. Emily married Philip Westover. All these children except Norman settled in Oswego county. X. As mentioned in a previous article John and Lena had a daughter Mary (b. 1782) who married a Benjamin Churchill (b. 1782) and lived in Oswego county: "Mary who married Benjamin Churchill and moved to Parish, Owego county and there died in old age and is buried in the Bidwell cemetery leaving no children who lived to maturity." (Family Bible quote from HFOTM). 1. Adison B Churchill was born in 1836, in Parish, Oswego, New York, according to the 1850 census; by the 1860 census he had disappeared from the record. 1. Wilson lived in Frankfort or Ilion. 2. Harriet: No trace of Harriet. 1. Dalavan's son Fred was a criminal lawyer in New York city. XIII. Nancy married William Bonesteel. Had children Caroline, Irene and Philander of whom we have no trace. 3. Alonzo, born July 23, 1832 in Oswego, Oswego, New York, married Lydia Rice (2 Oct 1832 - 1923) in Otsego, Otsego, New York, has grandson Homer House living near Rome, N.Y. And also a grandson Jerome living at West Winfield. a. Philip Borden Miller (1936-1958). b. Paul Edwin Miller (1943-1944). c. Michelle Merlin Miller (1955-1990). 1. Lois Margaret House (1914-1990). 2. Charolette Mary House (1917-1975). 1. Homer Frederick Foster, b. 27 May 1927 in New York; d. 21 Aug 1998 in Rome, Oneida, New York. 2. William F Stickles (b. 1883). 3. Gertrude Stickles (b. 1886). 4. John W Stickles (b. 1888). 5. Hattie J Stickles (b. 1894). 6. Lynn Stickles (b. 1897). 1. Milton Perry Chapman (1915-1966). 2. Victor L Chapman (b. 1919). iii. Edna Chapman (1898-1899) died as an infant in Otsego, Otsego, New York. d. Jerome House (1874 - 21 Apr 1940) married Jennie Rice, and lived at West Winfield. 4. Joel at one time lived in Camden, N. Y. No living descendants. 5. Sarah married first husband was named Miner and they had one son named Leroy. Her second husband was Henry Hoke and they had one son Alvin. 7. Herman married Alice Margaret Taylor. They had Howard now living near Richfield Springs. 8. J. Taylor now deceased left two daughters Alice and Katherine and Katherine, Lavina, Harvey J. Would be glad to have any information on the above sent to M. R. Shaver, Ransomville, N. Y. The House genealogy of the House family regarding the visit to Parish, Oswego county, 1822 is quite right. He also visited my great grand father John Marshall and Margrit Herkimer who were early settlers from Schuyler Lake. Many Mohawk families came to Parish vicinity about 1800-1822. John Marshall and Margrit Herkimer were great grandparents of my grandfather Marshall, the son of Margrit Herkimer and John Marshall has often spoken of the House family. 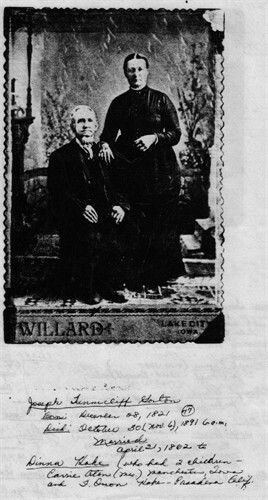 I have his marriage certficate, 81 years old (1852) married Harriet L. Burrows of Orriskany. His father John Marshall and Margrit Herkimer moved from Otsego county, Schuyler Lake with one horse and wagon. The wagon was loaded with their possessions. My great grandfather walked the distance and led the horse. 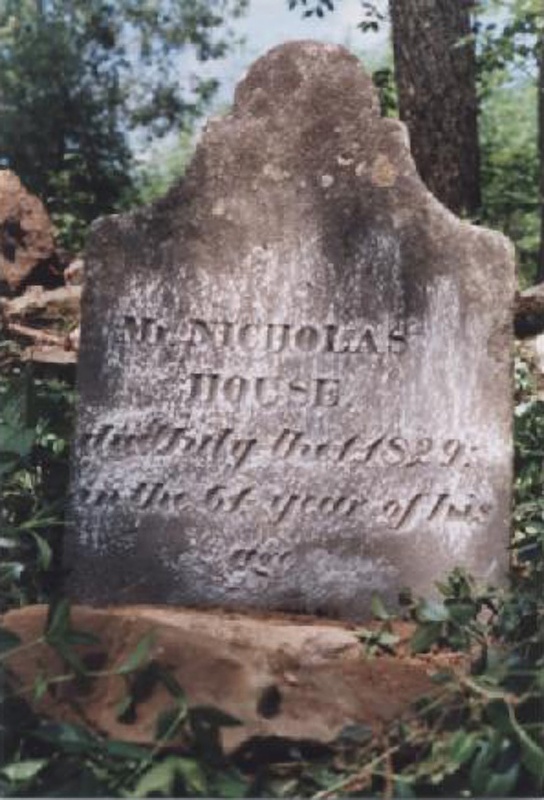 I am quoting from information furnished me by Mrs. M. W. Hatch of Richfield Springs, N. Y., who has devoted much time and effort to the study of the Nicholas House line and we believe it was through her effort that grave has been properly marked. A number of families by the name of House were occupying homes south of the Mohawk before the Revolution but relationship is not known. (The relationship has now been proven). Nicholas House born in 1769 married at Minden, Montgomery county, March 15, 1785 to Catherine Spohn ( Also spelled SPOON ) (daughter of Nicholas Spohn (SPOON ? ) and Elizabeth Devendorf.) Their home was the farm near Getmans Corners later owned by Newbern Myers. Tradition has it that he was gentleman who wore a silk hat and rode about in a fine gig. He was an early veterinary. 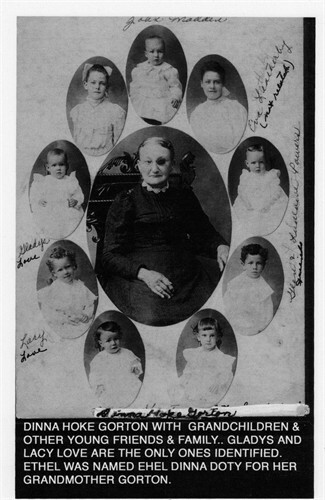 Their children were Nicholas, Jr., John Henry, Isaac, Jacob, George, Conrad, Anna Betsy Katy and Nancy. Nicholas House dies July 1, 1829 in the 61st year of his age. He and his wife Catherine are both buried in the cemetery at Getmans Corners on the William Christman farm and both have headstones. Department of the Interior, Bureau of Pensions, Washington, D. C.
Sir: In reply to your request for a statement of the military history of Nicholas House a soldier in the Revolutionary war you find below the desired information as contained in his (or his widow's ) application for a pension on file in this bureau. There is no definite statement of service. The comptroller of the state of New York shows payment to him for time he was a prisoner of war in Canada from August 1, 1781 to May 21, 1783. He belonged to col. Clyde's New York troops. No other evidence of service. Battles engaged in. None mentioned. Residence of soldier at enlistment Montgomery county. Date of application for pension by John House a son, February 5, 1846. Residence at date of application of John House, Columbia, N. Y. Age at application of John House fifty five years. 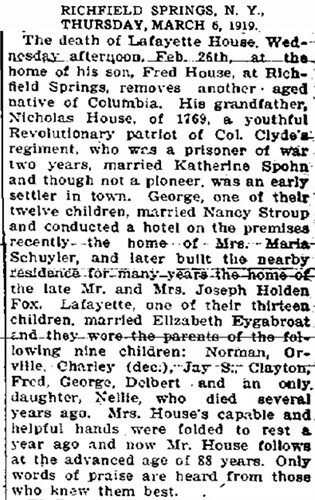 Remarks, Soldier Nicholas House married Catherine Spoon (Spohn) March 15, 1785 at Minden, N. Y. And died July 1, 1829. His wife died November 24, 1842. 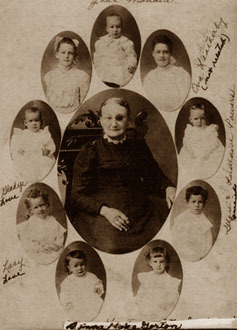 Pension was granted to children of John George, Nicholas, Jacob, Conrad, Henry, Isaac and Anna House and Elizabeth Van Alstine, Susannah Woodward and Nancy Vroman. NOTE BY MRS: "It would seem that there must be some error in either the birth records of Elizabeth and Anna or in their parentage but all records I have at present show the records as published above to be true but I can hardly account for the space of time from 1802 to 1817 having no birth records. The birth and war records of Nicholas House show him to have been less than thirteen years old at the time of his capture. The date of enlistment ID not given, but place of residence was and his age shows the very early age some of our patriot soldiers left their home to do service for the colonies." The children of Nicholas House, the brother of Jonathan and George and Catherine Spoon, (Spohn) his wife are as follows: Nicholas Jr., John, Henry, Isaac, Jacob, George, Conrad, Anna, Betsey, Catherine and Nancy. 1. Katherine was born in 1830 (Single). 3. Hiram was born on 30 Jan 1827 in Columbia, Herkimer, New York. He married Nancy Fraunce (Nov 1835 - 29 Aug 1923). 4. Nancy was born in 1830 (Single). a. James Smith (b. 1854) in Little Falls, Herkimer, New York. b. Henry Smith (b. 1858) in Little Falls, Herkimer, New York. c. George Smith (b. 1860) in Little Falls, Herkimer, New York. d. Mary Smith (b. 1863) in Little Falls, Herkimer, New York. She married Jason Decker (1861-1916) and they had the following children: Charlie Decker (1883-1938), Harriet Rebecca Decker (1885-1967), John T Decker (b. 1894) and Anna Elizabeth Freelove Decker (b. 1896). Mary died in 1923 in Cuylerville, Livingston, New York. e. Charlotte Smith (b. 1864) in Little Falls, Herkimer, New York. 6. Jeremiah (b. 15 Oct 1830) married a widow Sophie Humphrey (b. 1837). They live in Columbia, Herkimer, New York in the 1880 Federal Census. Nicholas Jr. died Aug. 8, 1871 aged 82 years, buried at Jordanvill, N. Y.
a. Fanny House was born @ 1862 in New York. b. Theresa House was born @ 1870 in Cortland, DeKalb, Illinois. c. Alfred Harry House was born in Oct 1877 in Cortland, DeKalb, Illinois. Alfred died on 5 Dec 1918 in De Kalb, De Kalb, Illinois. a. John House who married Alice Starkweather, lived west (St. Joseph city, Berrien, Michigan). They had a daughter, Kitty Bell House (b. 1892), who married Daniel Mansfield Cunningham (b. 1891) and they had the following children: Kathrine Jean Cunningham (1918-2007) and Mary E Cunningham (b. 1920). James House died and Cornelia married Abraham Myers of Mohawk. a. Charles W "Charley" (1856-1906), who in 1896, married Susan J (b. 1859) in Columbia Township, Herkimer, New York. b. Rosanna who married Peter Halmer. c. Another (Elva D House 1859-1872) married Dr. Hawks. 1. Rhoda married John C. Miller. 2. David married Mary Miller and second Angelina Spohn. 4. Harvey married Eliza Tarpening who after his death married Damon Brown. 5. Betsey married James Pierce and died two or three years after. 6. Gaylord married Nancy Skinner. 7. Lorenzo married Regina Tyler. 8. Delos married Jane Gamwell. 10. Margaretta married William Getman. 11. Martha married Delevan Armstrong. 1. Caroline born Jan. 9, 1827 married James Woodford. 1. Sanford born Oct. 28, 1831, died Aug. 6, 1870. 2. Diadama born Jan. 10, 1833 died young. 3. Abbie Catherine born Feb. 2, 1834 married Aufus Waldron. 4. Isaac born May 12,1837 died young. 6. Squire born Dec. 4, 1838 married Cornelia Orendorf and second Mrs. Klock. 7. Rodney born May 28, 1840 married Emily Staela. 8. 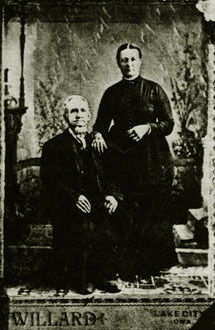 Harriet born March 4, 1842 (pictured at right) married Hamilton Steele and a son Claude A. lives in Ilion at present. 9. Melchar, born Mar. 18, 1846 died young. 10. Matthew born Oct. 23, 1848 married Nancy Casler, died March 9, 1880. 11. Dially Ann born Dec. 19, 1849 married Adrian Lewis, Aug. 7, 1867, second Adelmar Paster. Graves of George House (1787-1873) and Nancy Stroop (1793-1867) in Columbia Township, Herkimer, New York. a. Doris Esther House was born on 19 Aug 1909 in Auburn, Cayuga, New York. She married (1) Wilford E Smith and (2) Harold L Johnson on 10 Oct 1938 in Auburn, Cayuga, New York. She had two children: Jeanne E Smith and Marilyn Smith. She died on 5 Mar 1985 in Auburn, Cayuga, New York. a. Frank A House (b. 1908). b. Harold Lee House was born about 1915 in Auburn, Cayuga, New York; He died on 8 Nov 1962 in Auburn, Cayuga, New York. He married Pauline E French on 4 May 1936 in Auburn, Cayuga, New York. They had Bonnie House, Michele D House and 2 other children. B. Otis married Lana Miller, had a son Prof. Frank House. Otis married second Miss Underwood. He married a third time, lived at Oneida where he was killed crossing the railroad tracks. 1. Mary L Belding was born in 1878 in Moravia, Cayuga, New York. 1. Seward D Slade was born in about February 1867. He married Alice E in 1896, and they had a son (name unknown). He died in 1935. 2. Sabin G Slade was born in 1869 in Syracuse, New York. He married Louise Zinert in about 1894 in Denver, Colorado. He died in 1898 in Denver, Colorado. 3. 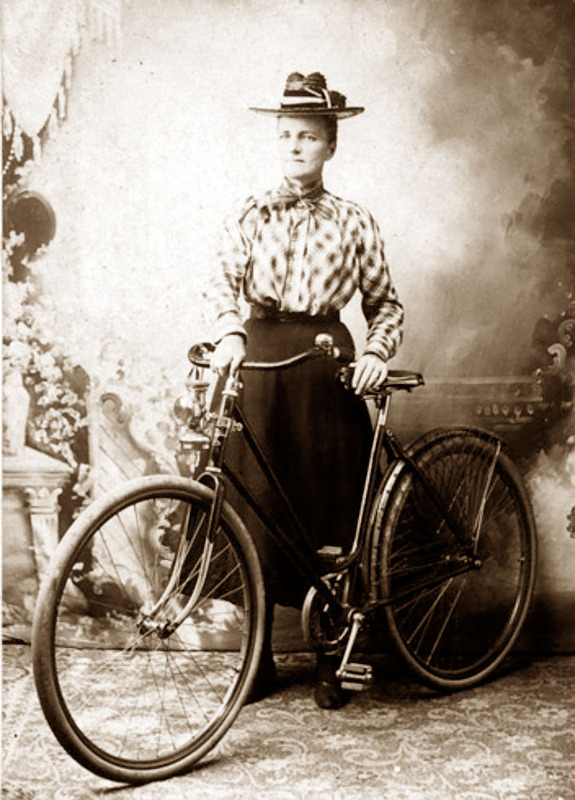 Carrie May Slade was born in May 1871. She died a teenager on 2 Sep 1888. Grace Eleanor Slade (1877-1959), wife of Charles Hercules Ebbets, Sr. (1859-1925), who owned the Brooklyn Dodgers from 1902 to 1925. 4. Grace Eleanor Slade was born on 22 Nov 1877 in Syracuse, Onondaga, New York. She married (1) Claude R Nott on 20 June 1900 in Watertown, St Lawrence, New York, but divorced in 1909; She then married (2) Charles Ebbets on 8 May 1922 in New York City, New York: In 1919, Minnie F. A. Ebbets sued for divorce from her husband Charles Ebbets, citing 'Mrs. Grace Slade Nott' as co-respondent. The New York Times, 11 Jan 1922, page 7. "WED AGES AGO, SAYS EBBETS, Baseball Man Asserts He Has Kept Marriage Quiet. The New York Time', May 10, 1922. PITTSBURGH. May 9. -- Charles H. Ebbets, President of the Brooklyn National League baseball club, in referring to the announcement of his marriage to Mrs. Grace Elinor Slade, which was made public today in New York by his son, Charles H. Ebbets Jr., tonight declared that the wedding occured 'ages ago.' Mr. and Mrs. Ebbets are here with the Dodgers. 'We've kept it quite pretty well and I don't see why my son whould have given us away like this,' said Mr. Ebbets. 'This is not our honeymoon trip. We were married some time ago and my wife is simply accompanying me on one of my regular business trips with the team.'" Grace died on 29 Apr 1959 in Mineola, Nassau, New York. 5. Fred Barry Slade was born in Jan 1886. No further information. a. Mary E Wilkinson was born in 1896 in New York. She married Bernard L Stevens on 8 Jun 1915 in Grace Episcopal Church, Albany, New York, and had a daughter: Judith Stevens. Mary died on 19 Feb 1986 in Deerfield, Oneida, New York. b. Clara Ethel Wilkinson was born on 4 Apr 1899 in Utica, Oneida, New York. She married Arthur William Bryan. Clara died on 13 Jul 1972 in Hartford, Connecticut. a. Nina L Wilkinson was born on 16 Jun 1896 in Utica, Oneida, New York; She died on 30 Jun 1896 in Utica, Oneida, New York. b. Helen Nina Wilkinson was born on April 9, 1899 in Utica, Oneida, New York. She married (1) Robert J Carlson on 10 Apr 1915 at Henry J. Emden's residence, Utica, Oneida, New York. She married (2) Robert E. Deforge in Cleveland, Cuyahoga, Ohio. Helen died on 6 Mar 1972 in Fremont, California. c. Sabin J. Wilkinson was born in Jan 1900 in Utica, Oneida, New York; He died on 13 Sep 1900 in Utica, Oneida, New York. a. Earl James Wilkinson was born on 31 May 1901 in Utica, Oneida, New York. He married (1) Elizabeth Rothing and (2) Mildred Goyer and had a daughter, Elisabeth Wilkinson. He died on 5 Jan 1988 in Poughkeepsie, New York. 1. John Garnsey was born about 1901. 2. Edwyn Garnsey was born on 2 Sep 1902 in Utica, Oneida, New York. He died on 21 Feb 1987 in Lake Worth, Palm Beach, Florida. 3. William H Garnsey was born on 21 Oct 1907 in Utica, Oneida, New York. He died on 22 Dec 1995 in Lake Worth, Palm Beach, Florida. ii. Clemuel Claude Morris was born in October 1880 in Nyles, Cayuga, New York. iii. Bernard Belding (step-brother) was born on 30 Jun 1890 in Niles, Cayuga, New York. He married Linda B Johnson. Moriavia Republican, 17 June 1910: "Shot While HuntingBernard Belding received word Tuesday that his father, Cyer Morris, of Herkimer, had been shot while hunting. Mr. Morris was out with a party of hunters and while lying on the ground was mistaken for a woodchuck and shot by one of his companions, the bullet taking effect in his hip. The son left last evening to visit his father." He died on 12 Aug 1964 in Moravia, Cayuga, New York. Moravia Auburn Citizen-Advertiser, Thursday, 13 August 1964: "Bernard Belding, 74, of Moravia, a retired building contractor and surveyer, died Wednesday at his home, 32 Church St., after a brief illness. Born in Vernon, he lived in Owasco for 34 years and in Moravia for the past five years. He was a vestryman of St. Matthew's Episcopal Church, Moravia, and a trustee of Owasco Rural Cemetery. He is survived by his widow, Mrs. Linda Johnson Belding; three daughters, Mrs. Vivian Quackenbush of Syracuse, Mrs. Marcia Piper of Hollywood, Calif., and Mrs. Evelyn Hale of Auburn; a step-brother, Leo Morris of Cedarville; a sister, Mrs. Maude Garnsey of Lantana, Fla.; nine grandchildren; three great-grandchildren and several nieces and nephews. Funeral services will be at 10 a. m. Saturday at the Wade Funeral Home, Moravia and at 10:30 in St. Matthew's Church, Moravia. Rev. Paul B. Miller, recter, will officiate. Burial will be in Owasco Rural Cemetery. Friends may call at the funeral home from 7 to 9 tonight and from 2 to 4 p.m. and 7 to 9 p.m. Friday. Those desireing to do so may contribute to the Cancer Fund or to St. Matthew's Church Memorial Fund." G. Seward M House was born on 4 Aug 1856. He married Anna M. Kenny on 15 Sep 1882. He died on 1 Oct 1931 in Herkimer, Herkimer, New York. Utica Daily Press, 2 Oct 1931: "Herkimmer, Oct. 1Seward M. House, 75, passed away today at his home 113 Court Street, following a long illness from complications. He was born in the town of Columbia, Herkimer County, in 1866, a son of the late Abraham and Mary Bronson House. On September 11, 18?2. He married Miss Anna Kanney of Canada. He leaves his widow and two sisters, Mrs. Clara Wilkinson, Utica, and Mrs. Benjamin Slade of Mohawk. Burial will be made at Mohawk Cemetery." 1. Claude H Vickerman was born in 1882 in German Flatts, Herkimer, New York. 2. Hazel Vickerman was born in Nov 1891 in German Flatts, Herkimer, New York. ii. Nora House was born about 1872 and married George Moore. 2. Isaac (22 Oct 1814 - 28 May 1879), the second child of George and Nancy, married Betsey (Mary Ann, 1822-1914) Thomas of England. b. Louisa House (b. Ma, 1847) married Charles E. Tripp (b. Feb 1847 in 1870, and they lived in Syracuse, Onondaga, New York. d. Christopher G House (b. 1849) in Herkimer County, New York. d. Charles Henry (b. 1847). a. Nelson Eysaman (1850-1917) On 2 Mar 1917, he was admitted into the Herkimer Counrty Poor House, and died 5 days later. On 6 Dec 1888, Joseph, then a widower, was admitted into the Herkimer County Poor House. Graves of Isaac House (1814-1879) and Mary Ann "Betsey" Thomas (1822-1914) at the Mohawk Village Cemetery, Herkimer Country, New York. 5. Jacob (b. 20 Aug 1820) was baptized at the Reformed Church of Columbia, Columbia Center, Herkimer County, New York (Source: Baptismal Record of the Reformed Church of Columbia, 1816-1826). "HOUSE, Jacob, son of George House and Nancy Stroup, b. 20 Aug, bapt. 25 Sep. Sponsors: Jacob House and wife, Cathrien." 6. Nancy (b. 28 Jul 1822) was baptized on 25 Aug 1822 at the Reformed Church of Columbia, Columbia Center, Herkimer County, New York (Source: Baptismal Record of the Reformed Church of Columbia, 1816-1826). "HOUSE, Nancy, daughter of George House and Nancy Stroup, b. 28 Jul, bapt. 25 Aug. Sponsors: Not named." a. Olcott N House (b. 1854) married Uretha M (b. Jun 1860). b. Perry J House (b. 1856) in Otsego, Otsego, New York. c. Sylvina House (b. 1857) in Otsego, Otsego, New York. d. Adna House (b. 1859) in Otsego, Otsego, New York. e. Elvinah House (b. 1863) in Otsego, Otsego, New York. 8. Harriet (b. 1826) married Orlando Hoke. a. Benjamin House (b. Nov 1855) married Abbie M. (b. Jan 1862) in New York in 1882.
b. William Wallace House (b. 1858) married Carrie M (b. Nov 1862) in 1884 and they had a daughter, Bessie Lydia House (b. Dec 1886) who married Charles A Phelps (1880-1935). c. Josaephine House (b. 1863). d. Alice House (b. 1864) married Samuel Holdredge (b. 1860) and they had a daughter, Rina M (b. 1888). e. Mariette House (b. 1865). f. Chauncey House, Jr. (1868-1942) married Clemma (b. @ 1873) in 1891, and had the following children: Charles Armstrong House (1892-1967), Edna House (b. 1900) and William C House (b. 1902). He married a second time, to Hattie Peck (b. 1874) on 13 Oct 1929 in Richfield Springs, Otsego, New York. Obituary for Lafayette House (1831-1919). a. Norman married Elizabeth Harter. b. Orville married Adelaide Ackler. c. Charley married Fannie McGreedy. d. Jay S married Ella Houghton Shepard. e. Clayton married Edna Wright. f. Delbert married Dora Cummings. g. Nellie who died young. 11. Mary Ann (b. 1816), daughter of George and Nancy, married William Canfield. b. Orson A Hoke (b. 1856). 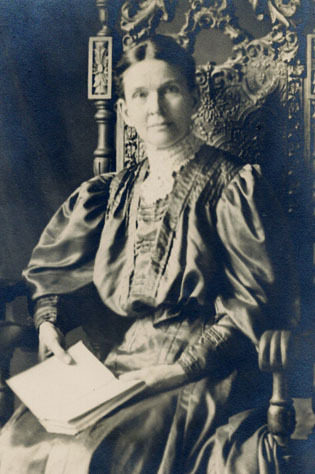 c. Ellen A Hoke (b. 1858). e. Eugene T Gorton (b. 1862). f. Flora Gorton (b. 1865). LEFT TO RIGHT: Diana House (1833-1907) and 2nd husband, Joseph Tunecliffe Gorton (1814-1891); Diana surrounded by descendants; Diana's grave marker. 13. 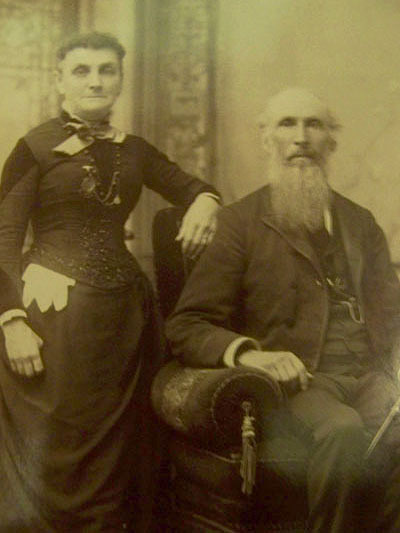 Jane D. (16 Oct 1835 - 16 Apr 1907) married Daniel Osterhout (b. 1838) and they lived in Warren, Herkimer, New York, through the 1870 census, after which they disappear from the record. 14. Manuel (Emanuel, b. 1838) died in the Civil War. He enlisted in Company I, New York 44th Infantry Regiment on 17 Oct 1861. He mustered out on 22 Apr 1862 at Old Point Comfort, VA, and was killed that day. He is buried at Hampton National Cemetery, Cemetery Road At Marshall Avenue, Hampton, VA 23669; Section B Site 4182. George House married second Betsy Thorp of Jordanville but they soon agreed to live apart. George and Nancy are buried in the Columbia cemetery. 1. A daughter (Elisebeth, b. 13 Jun 1817), married Dr. (Peter) Hawn. 1. Charles Dudley, born May 19, 1847. Catherine Augusta House-Shaul (1849 - 1930). a. Earl H Shaul (b. 1875) married Bernice M Green on 4 May 1898 in Herkimer, New York. b. Leila Pearl Shaul (1877-1973) married Frederic Thomas Lewis (1879-1941) in Richfield Springs, Otsego, New York, on 9 Jul 1914. They had a son named Donald Frederic Lewis (1915-1994). c. Ray Leslie Shaul (1884-1935) married Adele Crowe (1883-1978) on 10 Mar 1904 in Richfield Springs, Otsego, New York. They had two children: John Melvin Shaul (1909-1999) and Ray Leslie Shaul (1918-1990). a. Ralph W Shaul, Jr. (1875-1944) married Maude Widrig (1879-1965) on 22 May 1903, and had the following children: Eloise Shaul (1905-1980) and Genevieve Shaul (1911-1992). b. Louis Charles Shaul (1880-1969) married (1) Cora (1883-1909) in 1909, but she died the same year; He then married (2) Ruth Warren (1886-1970) and they had the following children: Richard Warren Shaul (1912-1991), Roger Louis Shaul (1916-1996). c. Harry F Shaul was born 2 Jan 1884 in Richfield Springs, Otsego, New York, and was a soldier; He died on 19 Apr 1947 in New York. d. Elmer Bryant Shaul (1887-1958) married Ruth Keller (1892-1981) and they had the following children: Lawrence Keller Shaul (1920-1989) and Barbara Elizabeth Shaul (1924-1960). Charlotte, the daughter of Mary Jacques by her first marriage, married William Petrie and they were the parents of Frank N. Petrie. a. Ellen F Wilkerson about 1856 in Warren, Herkimer, New York, according to the 1860 United States Federal Census. b. Orrin D Wilkerson was born about about 1858 in Warren, Herkimer, New York, according to the 1860 United States Federal Census. c. George M Wilkerson was born about 1862 in Warren, Herkimer, New York, according to the 1870 United States Federal Census. d. Annie L Wilkerson was born about 1864 in Warren, Herkimer, New York, according to the 1870 United States Federal Census. e. Freeman E Wilkerson was born about 1869 in Warren, Herkimer, New York, according to the 1870 United States Federal Census. a. Seward Green was born about about 1863 in Otsego, New York, according to the 1870 United States Federal Census. b. Dora Allien Green was born about 1868 in Otsego, New York, according to the 1870 United States Federal Census. a. Charles A House was born about 1856 in Herkimer, New York; He died on 23 Jun 1861 in Herkimer, New York. i. Maud C House was born about 1879 in New York, according to the 1880 United States Federal Census. i. Liby M House was born in June 1887 in New York, according to the 1900 United States Federal Census. ii. Albertus M House was born in May 1889 in New York, according to the 1900 United States Federal Census. i. Star House was born in August 1886 in Connecticut, according to the 1900 United States Federal Census. ii. Libbie L House was born in April 1889 in Connecticut, according to the 1900 United States Federal Census. iii. Ethel N House was born in January 1897 in Connecticut, according to the 1900 United States Federal Census. i. Lela Wilkerson was born in April 1890, according to the 1900 United States Federal Census. ii. Earl Wilkerson was born in May 1893, according to the 1900 United States Federal Census. 4. (Not in HFOTM) Elias House was born on 22 Aug 1824 in New York, according to Bible records in possession of Kay Waterman. In the 1850 United States Federal Census, he lives in Winfield, Herkimer, New York. Unknown spouse and children. 5. (Not in HFOTM) Urena House was born on 17 Jan 1827 in New York. She died on 25 Oct 1864 in New York, according to Bible records in possession of Kay Waterman. 6. (Not in HFOTM) Lovina House was born on Jul 1834 in New York, and died on 17 Mar 1835 in New York, according to Bible records in possession of Kay Waterman. 7. (Not in HFOTM) Useba House was born on 28 Oct 1841, according to Bible records in possession of Kay Waterman. 8. (Not in HFOTM) Mary Matilda House was born on 2 Jul 1843, according to Bible records in possession of Kay Waterman. 1. George Franklin Harter (1845-1906). 2. Catharine Maria Harter 1847 - 1885). 3. John Byron Harter (b. 1860). ii. Ada Waldo (b. 1859). After the death of James Waldo, Nancy married (2) Thadeus Getman (1845-1907) in Little Falls, Herkimer, New York, on 27 Feb 1883.
b. George VanAlstine was born in Jan 1838 in Columbia, Herkimer, New York. In 1882 he married Maria A (b. 1840). c. Betsey VanAlstine (b. 1841). d. Timothy VanAlstine (b. 1845) married Kathleen Deber (b. 1858) on 4 May 1906 in Leeds, Ontario, Canada. e. Newell VanAlstine (b. 1847). f. Adelina VanAlstine (b. 1848). i. Ella Ackler (b. 1854). ii. Adalade "Addie" Ackler (b. 1858). b. Lewis VanAlstine was born in 1835 in Ilion, Herkimer, New York. By 1870, he was in Dubuque Ward 3, Dubuque, Iowa. i. Floyd VanAlstine (b. 1866) moved to Ohio and married Emily Magdalene Kloffenstein (1866-1931) and they had the following children: John Elwood VanAlstine (b. 1888), Franklin VanAlstine (b. 1890). ii. Harriet VanAlstine (b. 1871). d. Emma VanAlstine (b. 1841). e. Leonard VanAlstine (b. 1843). f. Ellison VanAlstine (b. 1848). i. Carol Tilden VanAlstine (b. 1876). 1.Charles Seth VanAlstine (b. 1907). 2. Arthur D VanAlstine (b. 1911). i. Harold Vanalstyne (b. 1899). ii. Herman Vanalstyne (b. 1900). iii. Mae Vanalstyne (b. 1906). In 1881, Archibald married Sarah Elizabeth Stevens (1834-1918). He died in his 98th year and left sons Frank and James Van Alstine in Ilion. 1. Gaylord was father of Orrin, Andrew, Wellington, Clark, Mr. D. And Mrs. Orvillle Shaul. 2. Sophronia married Jeremiah Myers and had a son Newborn Myers lived in Mohawk. Harris Myers and Mrs. George B. Getman of Ilion are grandchildren. 1. William Alexander House (b. 1823). 4. Joseph H House (b. 1832). 6. George W House (b. 1837). 7. Delia Ann House (b. 1842). This record was compiled by Mrs. M. M. Hatch of Richfield Springs several years ago and the people named here are mostly dead, but as their descendants are mostly living in the valley. I believe it will be of interest to them. George House married Maria Mabie as early as 1776 but we have no record of his marriage. They were sponsors in that year at the baptism of Johannes Schmidt. The St. Johnsville Reformed Church records of July 7, 1793, volume 1 page 81 show George House and wife Maria, sponsors at the baptism of Maria daughter of John Kelly and Lea House. In the Rev. Abraham Rosecrantz German Flatts Reformed church records, Vol. 1 page 90 is this record. 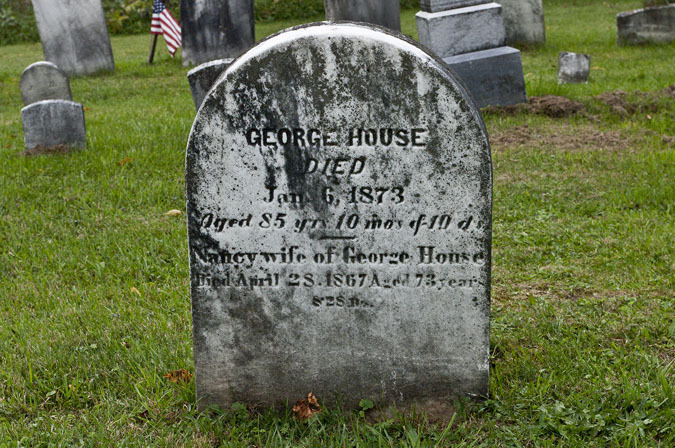 George House and wife Maria had son Nicholas born December 3, 1784. Nicholas House and Dolly Maybee sponsors. In the same records, volume 1, page 116 George house and wife Maria had daughter Christine born Dec. 31, 1786, baptized January 2, 1787. Sponsors Cobus Maybee and wife Christina. St. Johnsville Reformed Church record, volume 1, page 7, George House of Canajoharie Castle and wife Maria Maybee had son Conrad baptized Dec. 14, 1788. Sponsors Bartholomess Mabie and Margretha Freymauer. Volume 1, page 30 George House of Canajoharie Castle and wife Maria had daughter Anna baptized January 20, 1793. Sponsors Davis Hess and wife. George House and Maria Maybee were also sponsors at baptism of Wilhelm Forbes, son of Nicholas Forbes November 13, 1781. Nicholas Forbes in census of 1790 is given as living at Indian Falls. The census of 1790 shows George House living at Indian Castle or Canajoharie Castle as sometimes called, a near neighbor of his brothers Nicholas and Johnathan. In the same neighborhood lived the Herkimers and other prominent families of that period from whom have descended a long line of patriotic influential citizens. George House was a witness to the will of General Nicholas Herkimer. We would be very pleased if any of the descendants of George House and Maria Maybee who may read this or any others who have any data as to other children they had or any information concerning which has come down thru the generations would write me as I am very desirous of getting a more complete record. By M. R. Shaver, Ransomville, N. Y. In this chapter we will take up another son of Conrad House and his wife Engelge. Our studies into the history of the different House lines has shown very clearly to me that Captain Christian House was also a brother of the four mentioned above. The Stone Arabia church records show that Christian Hauss and Christina Rightmeyer were married September 10, 1765. The Rev. Abraham Rosencrantz German Flatts Reformed Church records show that Conrad House and Engelga his wife were sponsors at the baptism of several of their grandchildren among whom were children of Johnathan, Harmonus and Christian. In volume 1 page 27 they were sponsors at the baptism of Engelga, daughter of Harmonus House and wife Margretha. In volume 1 page 82 they were sponsors for Conrad son of Christian House and Christina his wife and on page 84 they were sponsors Engelga, daughter of Jonathan House and Lena his wife. In many other church records we find the same families very closely connected. As to the family of Christian House and Christina his wife we have a very limited record as we have been disappointed in our correspondence with some of their descendants. In fact the correspondence was all one sided as I wrote some time ago enclosing stamp for reply as suggested in the columns of the Enterprise and News but so far have received no reply to my inquiry. In addition to Conrad mentioned above there was a John Christian who married Anna Bellinger. In a letter received from Mrs. W. E. Hayes of St. Johnsville January 28, 1930 she says, "My mother was Rosina House. 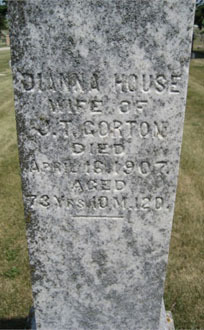 She was a daughter of John Christian House who was a son of Capt. Christian House. a. Mary Ann House (b. 3 Jan 1818 in Montgomery, New York). i. Horatio Delos House (1845-1904) married Sarah Martha Kehr (1848-1927) and they had the following children: Clarence A House (b. 1869), Edward Grant House (b. 1870), Roscoe House (1879-1954), Minnie House (b. 1888). ii. Martha V House (b. 1847 in Oppenheim, Fulton, New York). iii. Sarah M House (b. 1848 in Oppenheim, Fulton, New York). iv. William C House (b. 1851) married Mary E (b. 1852) in 1870 and had the following children: Tessie Roof House (1881-1983), Thesa House (b. 1890). v. George Wesley House (b. 1853 in Oppenheim, Fulton, New York). vi. Franklin H House (b. 1855 in Oppenheim, Fulton, New York). vii. Gideon Reese House (b. 1858) married Libbie (b. 1857 in Germany) and they had the following children: Daisy House (b. 1883), Charles L House (b. 1887), George House (b. 1893). c. (Baby Female) House (b. 1823). d. Lise House (b. 1826). e. Henry Nelson House (b. 1831). 2. (Nancy) Anna born Sept. 11, 1795 in Montgomery, New York, and died in 1845 in Danube, Herkimer, New York. 3. Peggy born April 5, 1798 in St Johnsville, Montgomery, New York. a. Jonas House (b. 1823). b. Jeremiah House (b. 1826). c. Lucinda House (b. 1827). d. Levi David House (b. 1828). e. John Jacob House (b. 1831). f. Elijah House (b. 1833). g. Mary C House (b. 1835). h. Joseph William House (1838-1839). i. Henry C House (1863-1939) married Anna I Perrine (1862-1939) and they had the following children: Helene House, Leroy C House, Daniel J House (b. 1883), Minnie House 1886-1948), Lena May House (1888-1964) and Victor H House (1901-1986). ii. James Frank House (1865-1883). iii. Edna May House (1880-1958) married Nellis Smith (b. 1881), and they had the following children: Carl M Smith (b. 1906), Norma Smith (b. 1910), and Helen Smith (b. 1913). 5. David born August 5, 1802 in St Johnsville, Montgomery, New York. He died on 29 Jul 1872.
a. Walter House (b. 4 Feb 1828 in Montgomery, New York). i. Walter Thomas Hayes was born on 17 May 1850 in Oppenheim, Fulton, New York, and died on 7 Nov 1928 in Altmar, Oswego, New York. In 1876 he married Roxy Clause (1856-1916) in St Johnsville, Montgomery, New York. They had the following children: Zaida Hayes (1878-1965), John Sebastion Hayes (1880-1962). ii. 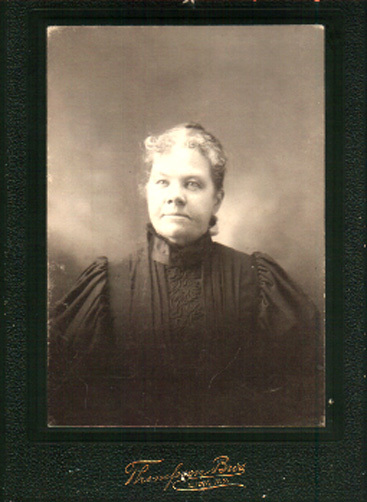 Frances Rosette Hayes was born on 12 Aug 1854 in Oppenheim, Fulton, New York, and married Nathaniel Hayes (1854-1927). She died on 5 Apr 1874 in Oppenheim, Fulton, New York. iii. Ella Decker (b. 1867) was an adopted daughter. 7. Joseph born Sept. 2, 1806 in St Johnsville, Herkimer, New York, and died February 23, 1893. 8. Daughter born 1811 who died in infancy. a. Edna M Vossler (No further information). i. Marietta Hayes was born 7 Mar 1855 in St Johnsville, Herkimer, New York. and died there on 28 Jun 1924. She married James Manly Porter (1850-1876) in Oct 1872, and they had a daughter, Ina Daisey Porter (1875-1925). ii. (Daughter) Hayes (b. 27 Aug 1856). iii. Donald Hayes (b. 17 Apr 1858). iv. Melvin Hayes was born on 11 Aug 1859 in Montgomery, New York, and died on 2 Aug 1939 in St Johnsville, Montgomery, New York. He married Ella D Decker (b. 1866) on 15 Sep 1886, and they had the following children: Lester Melvin Hayes (1887-1965) and Amos Floyd Hayes (1892-1893). v. Ella Hayes was born on 11 Nov 1864, and died in Aug 1939 in St Johnsville, Montgomery, New York. On 7 Nov 1883 she married William Edgar Hayes (b. 1856). Mrs. Hayes also states in her letter that in 1799 Capt. Christian House moved with his family on the farm where Nathan Cross now lives and fallowed farming. There is a record in the St. Johnsville Reformed Church dated January 17, 1790 showing the baptism of Catherine daughter of Christian House and Christina Rightmeyer of Youkers Bush. II. Catherine was born on 16 Nov 1789 in St Johnsville, Montgomery, New York, and died on 6 Mar 1871 in Kirkville, Onondaga, New York. She married Aaron Van Antwerp and a descendant of this couple now lives in Detroit, Mich. from one of whom, Mrs. J. A. Venable I have received valuable assistance in my research work. 1. 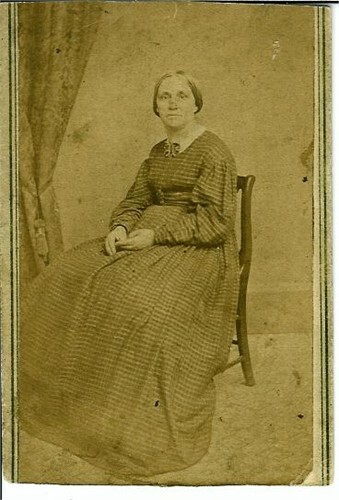 Ann Elizabeth VanAntwerp (1809-1850) was married to an unknown husband on 17 Dec 1829.
a. Sarah Catherine Van Antwerp (1834-1841). b. Maria Van Antwerp (b. 1836). c. Jane Van Antwerp (1838-1865). d. Henry R. Van Antwerp (1841-1844). e. Earl Van Antwerp (1844-1897). f. John A. Van Antwerp (1846-1877). h. Sylvester Van Antwerp (b. 1849). i. Elizabeth Van Antwerp (b. 1853). j. William C. Van Antwerp (1856-1908). 5. Henry Nelson VanAntwerp (1815-1852). 6. Margaret J VanAntwerp (1818-1890). 7. George A VanAntwerp (b. 1820). 8. James L VanAntwerp (1822-1892). 9. Nathan Christy VanAntwerp (1831-1916). 1. Henry C House (b. 1818). i. Frederick Hennagin (1872-1897) was killed by falling boxes of asphalt while at work. ii. Herbert F Hennagin was born on 15 May 1874 in Michigan. On 2 Sep 1903 he married Minnie M Lewis (b. 1876) in Pt Huron, St Clair, Michigan. He died on 24 Jun 1918 in Chicago, Cook, Illinois. iii. Bertie Hennagin was born on 1 Jun 1874 in Algoma, Kent, Michigan. She died before 1880.
b. Lois Lovilla House (1851-1861). c. Ann J House (1852-1854). d. Nelson C House (b. 1854). e. Florence Flora House (1859-1881) married Lyman Randall in 1879.
f. Henry H House (1860-1860). 3. Betsy Margaret House (b. 1820). 4. Peter H House (b. 1822). We have several letters from other members of the family who date back to Capt. Christian House but who have not their records complete enough to be authentic. Mrs. Elizabeth Brothers of Gloversville is one as is Mr. Roscoe House of Buffalo and brother Grant House of St. Louis, Mo. There is also many others of the Christian House line and we hope some day have it more perfected. Again we invite added information and criticism. Harmanus was born in Aug 1734 according to some church records, and christened on 2 Oct 1738 as "Hermanus House," at the Dutch Reformed Church at Tappan (N.Y. Historian Report, Vol. 2, p. 694). This would make him a sibling or cousin of Conrad (born only five-to-ten years earlier), instead of his son, so it appears there were a few Harmanus Houses running around Tryon County. Records have him variously named Harmonious, Hermanus, Harmanus,, and even Adam. In 1751, he was married to Maria Margaretha Walrath (1729-1816). The Harmanus we are concerned with here was born in 1748 in Mohawk Valley, Tryon Co., New York, and his Christening was in 1751 in Stone Arabia, Tryon Co., New York (Stone Arabia Reformed Church records). Not much was written about Harmanus in the House Family of the Mohawk, but he is one of the most fascinating (and depending what side you were on) most heroic House members in our genealogy. As a Tory who rode with Butler's Rangers, he fought for his beliefseven against members of his own familyand stayed true to those beliefs until the day he died. 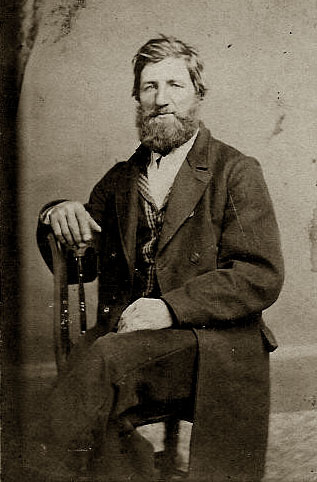 Most family histories claim that Harmanus was the only Tory who fought with the British during the Revolution, and as a Loyalist, emigrated to Canada. However, early records of Niagara give the names of Phillip and George House. In the War of 1812, Andrew, Frederick, and Patrick served with the 4th Lincoln Regiment and Nicholas House with the 2nd. When the Loyalists lost the war, Harmonas's house (no pun intended, I swear) and possessions were confiscated by the new government of the United States of America. On the 15th of July, 1783, Hermanus, listed as a yeoman from Canajoharie, Tryon Co., NY, his wife Margaret Walrad, and their children John, Dan, James, Anna, Julia, Hulda, Catharina, Robert, and Mary, were stripped of their land and possessions in Tryon County. The confiscated property was then auctioned at a Sheriff's Sale. But Harmanus was long gone, and had already taken his family to Lincoln Co., Ontario, Canadaalthough it appears that some of his children stayed behind. THE HOUSE FAMILY IN CANADA, updating the neglected genealogies in The House Family of the Mohawk, to reveal that the Loyalist side was just as brave and heroic. TOP PAINTING: "View on the Schoharie" (1826), by Thomas Cole (1 Feb 1801 - 11 Feb 1848), an English-born American artist. Cole is regarded as the founder of the Hudson River School, an American art movement that flourished in the mid-19th century.